Who doesn’t like the idea of beaches, good food and lots of fun activities to ring in the New Year? Well, if you’re looking to make your dream New Year’s Eve holiday a reality, then plan to head to Byron Bay this year. No matter if you’re coming with family, friends, or that special someone, you won’t lack for things to do in Byron Bay. Byron Bay has an excellent range of events for the holiday, ranging from an alcohol-free party, to fancy dinners, to catching the first sunrise of 2019. Check out all these Byron Bay events for next weekend and head here for a fun holiday! Want a family-friendly event to ring in the new year? Check out Soul Street, Byron Bay’s alcohol-free street festival sponsored by The Byron Community Centre. Starting at 4 pm and continuing until 10 pm, Soul Street takes place on Jonson Street, which is closed down for the event. Here you’ll find everything from cabaret, music and dance to kids play zone, food stalls and circus acts. FYI, Jonson Street shuts down from noon on New Year’s Eve until 8 am the next morning. So plan ahead by thinking about riding bikes or walking up to the event, or if you still want to drive, then you can use the free parking at the Butler Street Reserve (a short walk away). You’re in luck! Tickets for this cool annual music and arts festival are still available. The Falls Festival, which takes place this year from 31 December 2018 to 2 January 2019, offers a memorable way to spend your New Year’s Eve holiday in Bryon Bay. If you attend the festival, you’ll have a chance to hear such musicians as Anderson .Paak and the Free Nationals, Catfish and Bottlemen, Vance Joy and many more over the three days. Looking for a good party with good food? You could spend your New Year’s Eve in Byron Bay at Balcony Bar & Oyster Co where you can enjoy cocktails, dinner and dancing until the first couple of hours into 2019 (2 am is when they kick you out!). Tickets cost $110 per adults, and you can reserve a seating at either 9, 9:30 or 10 pm. Bookings are required. Just a note that if you’re with your family, Balcony will be open for dinner from 4 to 8:30 pm. Bring your mates and plan to dance your way into 2019 at the NYE party at Bryon Bay Brewery. Beginning at noon on New Year’s Eve day and continuing until 2 am on New Year’s Day, the brewery will host two stages with DJs and live music for all 14 hours–plus plenty of cocktails. Artists include Benson, Harts, Human Movement and much more. Early bird tickets are sold out, but second release is still on for $80 per person (plus fees). Make sure to grab your tickets soon if you’re interested as prices will go up the closer we get to the big day. This New Year’s Eve party, held at Harvest in Newrybar, features a bubble bar, a “feast,” jungle bar, Spanish paella, wild spritz bar and more. Themed “Wild,” you’ll have access to several areas including the restaurant, bakery, garden and fire pit where you can eat, drink and dance to the tunes of DJ Beaver and Justin Time. The cost is $225 per person and runs from 7 pm to 1 am. Be sure to make reservations if you’re interested in attending. Catch the first glimpse of sunlight in 2019 by attending the First Sun New Year’s Day First Sun New Year’s Day event. Held at the Cape Byron Lighthouse, First Sun begins at 5 am sharp and kicks off your new year with peace and health. Bring your yoga mat, warm clothes, a torch, blanket, sunglasses, hat and water. Clarkes Beach carpark is open starting at 4am, and participants can walk from there to the lighthouse. If you’d like, there’s a guided walk that starts at 4:15 am, or you can ride one of the free shuttle buses from 4:30 to 8:30 am. Have we convinced you yet? Don’t waste anymore time and book that holiday next week, and spend your New Year’s Eve here in Byron Bay. 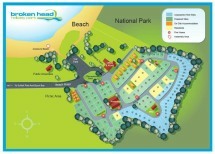 With all these great ways to ring in 2019, you should plan to stay at Broken Head Holiday Park so you’ll save on accommodation and have more funds to have fun while you’re here. Happy New Year!